We performed Irei-sai, a Sintō Memorial service on Sunday, March 10th for the victims of the Tōhoku earthquake and tsunami that devastated Japan in 2011 and 2016 Kumamoto earthquake, 2018 Hokkaidō earthquake. 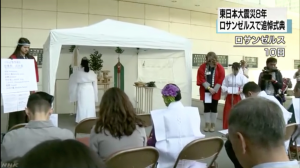 Our service was aired on abc TV and NHK as well as other media. 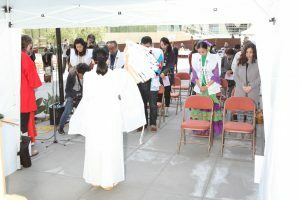 Through impression of traditional Japanese ritual, Shintō service, more people got encouragement to pray victims and remember people are still suffering, have not done recovering, as well as how the importance of preparation. NHK report can watch this link. (Note: It might have expiration date of this link). We will hold a Shintō memorial service on Sunday, March 10th for the victims of the Tōhoku earthquake and tsunami that devastated Japan in 2011. This ceremony will be performed as part of the “Love to Nippon” event. Please come and pray with us for the spirits of victims. Shintō is the basis of Japanese culture and customs. From ancient times, the Japanese have believed there are deities in everything, and paid their respects by building Jinja (Shintō shrines) in places where those deities are believed to reside. Japanese fishermen, whose livelihoods depend on the ocean, strongly believe in the spirits of the ocean and pay their respects in this Shintō tradition. Many fishermen and their families were victims of the Tōhoku earthquake and tsunami in 2011. In this ceremony we will also be honoring the victims of the Kumamoto earthquake of 2016 and the Hokkaidō earthquake of 2018. Unlike the Tōhoku earthquake, these disasters primarily affected people living in mountainous areas and close to the natural forests where Shintō deities are believed to reside. As Shintō priests, it is our duty to calm these natural spirits both at sea and on land. For over 800 years, Shusse Inari Jinja has been located in Shimane Prefecture, where all of the deities in Japan are said to gather once a year. Even though Shimane is geographically far from Tōhoku, Kumamato, and Hokkaidō, we share the same respect for Shinto deities. As a Shinto priest from Shusse Inari Jinja and Shusse Inari Shrine of America, I would like to perform a ceremony of requiem to bring peace to the spirits of the victims of this tragedy. Our service will take roughly 20 minutes, beginning with a purification ritual and continuing with offerings and prayers for the victims. Although 20 minutes may seem like a long time, each element of the service is important, and skipping or shortening any portion would be disrespectful to both the spirits as well as the victims we are honoring. Passing along eco-conscious traditions to the next generation. Shinto is a mindset and way of living with respect for nature, living things and our ancestors, and it has long been recognized as Japan’s cultural root. Unlike Buddhism, Christianity, or other religions, Shinto has no holy texts, nor individual founder. It is said that Shinto has been practiced for more than 2,000 years. One of the most important elements of Shinto practice is paying respect and seeking harmony between people and nature, among our families, communities, and the world. In today’s society, the need to strive for these goals has become more apparent than ever before. We hold various events introducing the traditional Japanese eco-conscious way of life so that future generations can enjoy nature as we do. Details about Shinto and these events can be found on our Newsletter, website, and social media. Please come and enjoy our events!! May the Shusse Inari Spirits be with you! We held Setsubun-sai on Friday, February 1st at Montessori International Academy (2717 South Halladay Street, Santa Ana, CA 92705). After the ceremony, we provided Setsubun-no-Harai and Yakubarai for Yakudoshi (critical year) services. We also provided traditional ritual services for purifying and recharging the spirit. Please see below. And we provided Gokitoh service of Yakubarai for Yakudoshi (critical year) people. The original meaning of Setsubun is “dividing season,” and the beginning of each of the four seasons was called Setsubun. However, the day before the first day of spring in the lunar calendar is New Year’s Eve, and as it marks the seasonal change from harsh winter to spring, it came to be considered an especially important day. During the Edo period, Setsubun came to exclusively mean the day before the first day of spring. This year, the first day of spring is actually February 4th, making Setsubun February 3rd, but we held Setsubun-sai on February 1st due to venue availability. We hold this Setsubun ceremony to show respect and appreciation and present our wishes to the nature spirits. This ceremony is free to attend. About Sestubun-no-harai (Purify and recharge your spirit for The New Year). This is a very traditional ritual service that has been passed from generation to generation for many years in Shusse Inari Shrine. This ritual is centered around the use of Hitogata. From ancient times, the Japanese people have prayed for purification, and to be rid of the previous year’s Kegare. New Year’s rituals are for cleansing and refreshing of energy for their spirit. Kegare, or “withered spirit”. Over the course of the year, the energy of a person’s spirit is diminished by tiredness, stress, and other pressures, so New Year’s rituals are performed to cleanse and refresh this energy and recharge the spirit. We distribute Hitogata at the Setsubun-sai venue, so please let us know if you are interested in this service. Please reference our flyer for more detail about Hitogata. 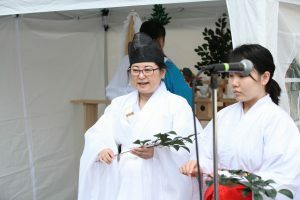 The Hitogata is a minimum $10 donation in advance per participant (including the ritual service fee) Note: Attendance of this ritual service is not required. Over the many years of a person’s life, many changes may take place in their body and/or environment. As a result, it is said there is a risk of meeting with misfortune. Years in which there is an increased chance of misfortune are called Yakudoshi, meaning “Critical Years.” It is apparent from historical texts that Yakudoshi already existed as a custom during the Heian Period in Japan (794 CE – 1185). However, Yakudoshi are not the only years that one needs to take into account. In addition to the designated critical year (or “Hon-Yaku”), the year before a critical year (“Mae-Yaku)”, and the year after (“Ato-Yaku)”, also require careful attention in order to avoid misfortune. For this reason, it is necessary to think of Yakudoshi as a three-year period. During this three-year period, people go to Shinto Shrines in order to receive prayers from priests to ward off evil and to cleanse themselves of its influence. People also pray to purify their bad luck, and for good luck charms to bring about better fortune. It is said that Yakudoshi begins from first day of spring, so it is customary for people of Yakudoshi age to receive Yakubarai (purification) services on that day. The Yakudoshi ages for women are 18, 32, and 36, and for men are 24, 41 and 60. We provid Yakubarai services for Yakudoshi. An appointment is required for the Yakubarai service, please contact us to schedule. The Yakudoshi service fee is minimum $60. Purify and recharge your spirit for The New Year. Setsubun (February 3rd) is New Years in the lunar calendar, it is the day a new season begins. From ancient times, the Japanese people have prayed for purification, and to be rid of the previous year’s Kegare. New Year’s rituals are for cleansing and refreshing of energy for their spirit. Kegare means “withered spirit.” During the year, the energy of people’s spirit gets low due to tiredness, stress, etc. Shusse Inari Shrine of America provides traditional ritual services for purifying and recharging the spirit. One of the ritual actions taken for this is the use of Hitogata. (Paper shape of human; Please see illustration). Please write your name and age on the Hitogata, then wipe the Hitogata on the body part you want to improve or renew. For example, wipe your knee if you have knee pain, or wipe your head if you want to be smarter, etc. Finally, hand us the Hitogata before the ceremony if you plan to attend the Setsubun ceremony. 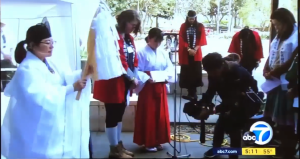 We will hold 2019’s Setsubun ceremony on Feb. 1st at Montessori International Academy (2717 S. Halladay St., Santa Ana, CA), details can be found on our Newsletter, website, and social media. If you do not plan on attending, please mail the Hitogata back to us with application form. Please print clearly since we read them during the ceremony. In Shinto, it is believed that the Hitogata represents the person concerned, so in the ceremony it carries all their Kegare. The service fee for this purifying and recharging the spirit at Setsubun is minimum $10 per person (For our shrine members there is no fee for this purifying and recharging the spirit service, since it is included in the membership fee). If you are interested in this service, please email us to further information. Hitogata need to be received no later than January 31st. 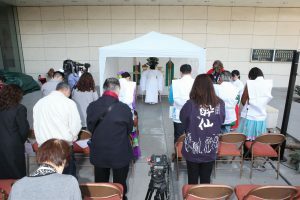 We held Saitan-sai on January 1st at Little Tokyo for praying everybody’s prosperity, safe and healthy life as well as world peace. We wish you a new year filled with prosperity and happiness! Arigato for all to come and pray at our booth. Arigato for volunteers to help our booth where was extremely popular in the event. This year, we will start to organize 奉賛会Hōsankai which is a group of contributors for our shrine. Many people have asked us the location for Shusse Inari Shrine of America and wish to visit to pray. Since Los Angeles is one of the highest land price area, we need huge help to make it happen. So that Hōsankai takes part of fundraising project for permanent place (or regular place or facility) of our Shrine. We hope you can play big role to help for fundraising and spread the word about our project to people who are interested in Shinto. At the permanent (or regular place) of our Shrine, we would like to hold not only Omatsuri (ceremonies) and Gokitō (services) but also various events such as Japanese language class, culture class, Japanese Mythology class, exhibitions and En musubi party as well as Oharae-no-kotoba writing class, making Chino-wa, Shime-nawa, Shime-kazari and Kadomatsu. We will announce our Hōsankai launch information when it is ready. Yes!!! We will be back to have booth at Little Tokyo on the New Years Day, January 1st, 2019! We will hold Saitan-sai for praying people’s happiness, safety, success and world peace. You are very welcome to attend Saitan-sai as well as personal prayer. We will have Hamaya, Kumade, Ofuda and Omamori as well as Gokitoh such as Yakuyoke etc… (Please make appointment for Gokitoh before Dec. 30th). We are looking for volunteers for this New Years event. Please contact us for details. We held the Aki (Autumn) Matsuri and 753 (Shichi-Go-San) ceremony. 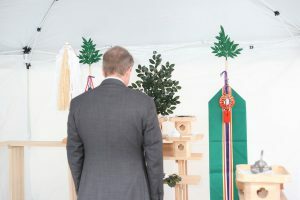 At Aki Matsuri, we showed appreciation all harvest, success and improvement in 2018 as well as praying great harvest, success, improvement and world peace in 2019 to Kami / spirits. This is the traditional custom and culture which Japanese has been passing along from ancient. At Shichi-Go-San, we provided blessing service to the family who attended. These family showed appreciation to Kami / spirits and prayed their children’s health, happiness and success. We supported their prayers to Kami / spirits. In Japan, Shichi-Go-San (7-5-3) is celebrated every November 15th. This ceremony is performed to honor children and dates back to the 17th century. The ceremony is held for all children who are three, boys who are five, and girls who are seven. The ceremony is a very big day in their lives (ages are in Asian reckoning*). Children are dressed in their best traditional clothes which are age appropriate, and their parents take them to a shrine to be blessed by priests. The parents and children both offer their thanks to the deity in appreciation. For the parents, this marks a significant step in their child’s life, and one in which the parents are grateful for the child’s health and well-being. 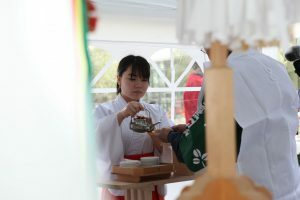 We held Aki Matsuri at Koda Farms. We showed appreciation of this year’s great harvest and pray next year’s great harvest and safety. We held Hatsuuma Matsuri(Spring festival)on March and Taue Kiyobarai (Purification field for Planting Ceremony) on April. We plan to sell rice from the field we held ceremony from January 1st. Details are forthcoming. 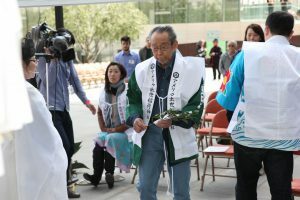 Thank you for attending to Kodama Shizume no Matsuri (Calming Spirits of Trees Ceremony) on Sunday, November 4th at The Learning Garden (Venice High School) in Los Angeles, CA! We had about 40 people paid respect and appreciation to tree spirits. We had an introduction / lecture about Shinto and explain about ceremony program as well as what Shinto priest will read as prayer (which is more like poem) to spirits. Also we practice praying method and Temizu (purification with water). The ancient Japanese people understood that every natural object and phenomenon possessed a spirit. Feeling awe and deep reverence for nature, they came to regard these spirits as Kami (deities). Over time, jinja (Shinto shrines) were built where these Kami were believed to dwell. The practices of prayer to these Kami, as well as the mindset of harmonious living with divine nature, was handed down from generation to generation and is today called Shinto, or “Way of the Kami”. Shinto is the way of living which respects nature, other people, and ancestors. Shinto is a mindset and way of life that has long been recognized as Japan’s cultural root. Unlike Buddhism, Christianity, or other religions, Shinto has no holy texts, nor individual founder. While Shinto is distinctly Japanese, anybody may practice. After all, every person is in the midst of divine nature and every person receives its blessings, such as the fruits of the earth and the warmth from the sun. What we do at the ceremony is paying respect, show appreciation, and tell our wishes to nature. One of the most important elements of Shinto practice is seeking harmony and co-existence not only between people and nature, but also among the people of our families, communities, and world. In today’s society, the need to strive for these goals has become more apparent than ever before. The lifestyle of Shinto offers a timeless, harmonious spirit to draw upon as we work towards a peaceful world for all living things. Let’s pass along Japanese eco-friendly traditional lifestyle to next generation! our future generation can enjoy nature like as us. Please come and enjoy our events!! On Friday August 31st, 2018, our Shrine’s priestess, Rev. Izumi Hasegawa was in the History Channel to talk about Shinto and AI. Since in western countries, where AI is looked at with fear and at times for making weapons, but Japan sees AI and robots more as “friends,” rather than as tools for helping humans. Where does this sense come from? Pepper, ASIMO, Paro, August 31, 2018 – Japan continues to be at the forefront of developing AI robots. Unlike in western countries, where AI is looked at with fear and at times for making weapons, Japan sees AI and robots more as “friends,” rather than as tools for helping humans. Where does this sense come from? The Japanese feel that everything has a spirit. Their traditional customs revolve about coexistence and seeking to live in harmony with their natural surroundings. That mindset is reflected in the creation of stories like “Astro Boy,” “Doraemon” and “Pokémon” even though in modern days the Japanese seem to have lost touch with that ancient knowledge and Shinto customs. In highlighting those distinct cultural differences, Rev. 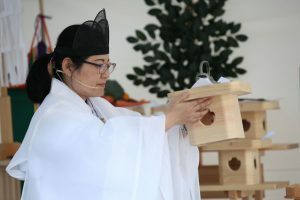 Izumi Hasegawa, the Shinto Priestess will discuss topics such as the importance their eco-friendly lifestyle and how to pay respect to nature, which is similar to the Native American culture. Bringing together these ancient customs and intersecting them with future technology is what will keep those traditions alive and a point of discussion for generations to come. and world” said Rev. Izumi Hasegawa. “In today’s society, the need to strive for these goals has become more apparent than ever before. The Shinto lifestyle offers a timeless, harmonious spirit to draw upon as we work towards achieving a peaceful world for all living things.” May Shusse Inari be with you! June 9th and 10, we held Kaki Taisai as well as the event of Let’s Kaiun. We held Shinto workshop for foreigners on June 8th. We plan to hold this workshop again on May/June 2019. We also plan to organize Japanese mythology tour by Shinto priest around that time. Stay tune for details! Shusse Inari Shrine of America is the American branch of Shusse Inari Shrine, located in the city of Matsue in the Izumo region of Shimane Prefecture. Shusse Inari Shrine has been respected by the feudal lords of Matsue, as well as the area’s local people, since the 12th century. The main deity enshrined here is 宇賀之御魂神 (Uka-no-Mitama-no-Kami), who is the deity of productivity, business, food, and harvests, and whose workings give us life as human beings. It is through this kami’s divine virtue as the root of life that we can enjoy the blessings of nature. Also enshrined here are 誉田別命 (Homudawake-no-Mikoto), to whom Samurai paid respect, as well as the deity of water and the deity of health. Shusse Inari Shrine is known for having the power to bring good luck, business and career success, recovery from illness, marriage and relationship happiness, good catches of fish, huge harvests and student success. Lately, Shusse Inari Shrine has also become popular for bringing good luck in the lottery. Shusse Inari Shrine of America performs various prayer services such as for business success when you open a new restaurant or office, safe driving for a new car, safety and success of karate/judo/kendo dojos, Shichi-go-san (7-5-3 rites/blessing ceremony for children), weddings, etc. Feel free to ask us. 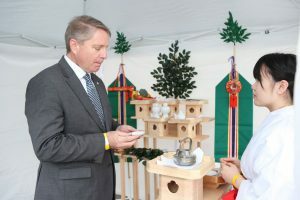 Information about the priest of Shusse Inari Shrine of America can be found at the About Us page.